I am a 34 year old Teacher and Stampin' Up! Demonstrator. I used to work as an interventionist for children with Autism but now work as a Teacher at a School Age Program in Pasadena. I love faeries and collect anything I can get my hands on that has to do with Faeries! 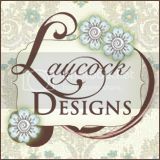 NEW 2011-2012 Idea Book & Catalog! Idea Book and Catalog Supply List Here! NEW 2011-2012 Celebrando Creatividad Catalog! Celebrando Creatividad Supply List Here! Summer Mini Supply List Here! 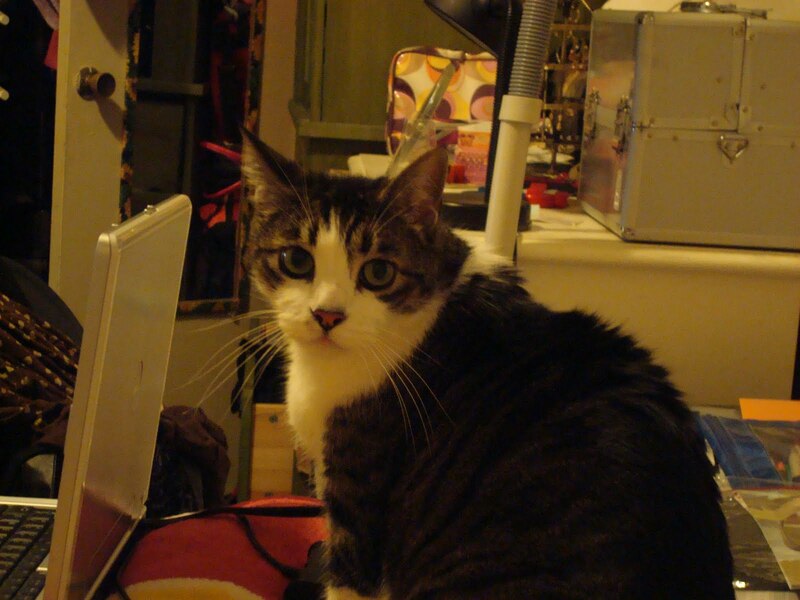 Here's a picture of my baby boy Angel. 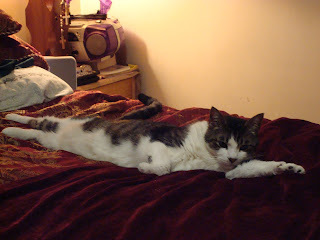 This was prior to his getting sick. As soon as he's feeling 100% I will post a picture of him again. Isn't he such a cutie pie? And a bed hog too! Hee,hee! :oD Thanks again for the well wishes! 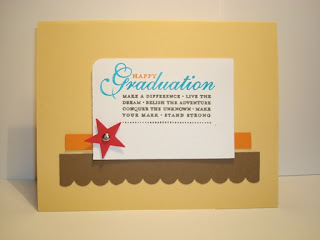 Here's a Graduation card that was also CASED from the Summer Mini Catalog. Another quick and simple card that can easily altered to match the colors of any specific school or university. I love the simplicity of the card but it is still quite striking don't you think? This card uses the a la carte stamp, Happy Grad. It's a great deal at only $8.95 for the stamp! It was colored in using Soft Suede, Pumpkin Pie and Tempting Turquoise Stampin' Write Markers. The card base is out of So Saffron, the smaller strip of cardstock is Pumpkin Pie and the scallop piece is Soft Suede. Just a quick reminder that tomorrow is the LAST DAY to order from the 2009-2010 Idea Book and Catalog! So CLICK HERE to order from me directly 24/7 or EMAIL ME. You can find the Last Chance Lists on the side of my blog. The colors are Soft Suede, Tempting Turquoise and So Saffron. 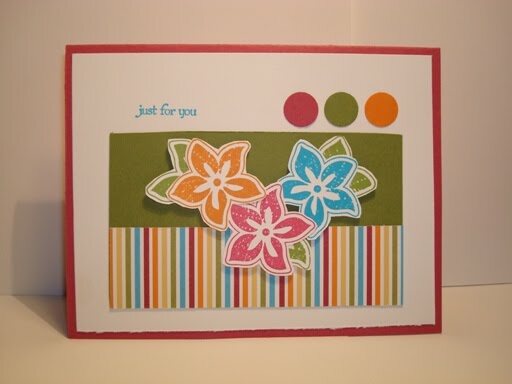 The sentiment is a la carte stamp at the back of the mini catalog called, Birthday Block. It's a great deal at just $7.95! You can't beat that! :o) So what we did was color in the stamp with the Soft Suede Stampin' Write Marker except for the word "Day" that was colored in Pumpkin Pie. 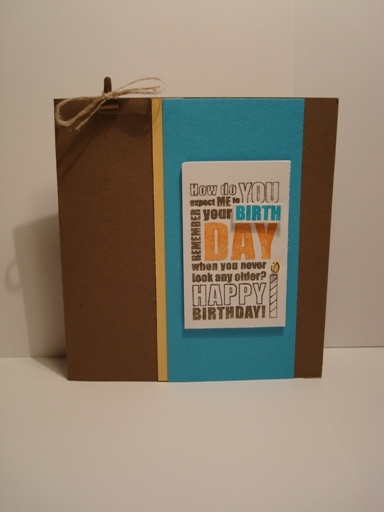 The word "birth" was colored in using Tempting Turquoise and cut out then popped out with a Stampin' Dimensional over the original stamped image. We also colored in the flame from the candle using So Saffron ink. The final touch was using the Mini Library Clip and tying a bow around it using the Linen Thread. That's it! I hope you enjoyed the card today. 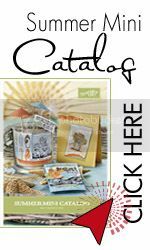 Reminder: June 30th is the last day to order from the 2009-2010 Stampin' Catalog and to order any of the retiring stamps and accessories so don't delay! I know I have been absent for a few weeks but I apologize. I've had a crazy last few weeks or I should say month! Plus, with the end of the school year and the summer program starting, things have been hectic at work. I also got away for a weekend and went to Vegas, watched the Jabbawockeez perform and was surprised with tickets to go see The Beatles Love at The Mirage. If you've never seen it I highly recommend it. Especially if you love the music of The Beatles. Oh my goodness it was beautiful and engaging and just amazing!! Okay, enough babbling and on to the projects. 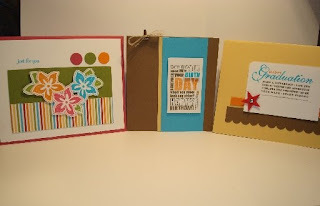 These were projects that we did at my Summer Mini Workshop in May. The projects were all CASEd from different places, so enjoy! Here are the 3 projects together, aren't they great? Here's the first card we made. It was a complete CASE from Connie Babbert. You can find her original card at her blog, Inskpired Treasures. If you look at her card the only differences are that I didn't use the brads in the center of the flowers or the Designer Label Punch for the sentiment because I don't have them. Hee,hee ;o) Isn't it a beautiful card? I love that the colors all play off from the strip of the Island Oasis Designer Series Paper. Oh ya, she also used the Polka Dot Impressions Folder on the Whisper White Cardstock and I did not. The base of the card is Rose Red and then layered a piece of Whisper White Cardstock on top. I punched out three 1/2" circles out of Pumpkin Pie, Rose Red and Old Olive. The sentiment is from the Teeny Tiny Wishes stamp set. It was stamped in Tempting Turquoise and I used the Stamp-a-ma-jig for perfect placement! Just a quick reminder that you have until the end of the month to purchase any items from the last chance lists! Contact me if you'd like to order or if you have any questions. Order from me 24/7 by clicking HERE. Potential recruits can join Stampin' Up! as a demonstrator for just $99 when they purchase a special Mini Starter Kit. All items below are recommended, but a new recruit can substitute a like item of equal or lesser value. Today is June 1st and you know what that means don't you? Yup, the Last Chance Lists are now here! 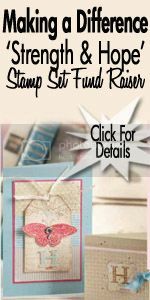 In order to make room for new stamp sets, accessories and even Big Shot Dies, Stampin' Up! has retired lots of items. Check out all the lists and make sure to purchase those items you need, er want before it is too late. As always, you have until June 30 to purchase these items until they are gone for good! But, don't wait until then because as it oftentimes happens, several items sell out before that. You can view the RETIRING ITEMS THAT ARE 25% OFF HERE. You can view the RETIRING ITEMS THAT ARE 50% OFF HERE. You can view the RETIRING STAMP SETS HERE. You can view the RETIRING ACCESSORIES HERE. You can view the RETIRING DECOR ELEMENTS HERE. You can view the RETIRING BIG SHOT DIES HERE. You can view the RETIRING PUNCHES HERE. You can view the RETIRING RIBBON HERE. You can view the RETIRING STAMPIN' AROUND WHEELS HERE. To order any of these items at any time, CLICK HERE. Have a great night and Happy Stampin'!